When you buy used vehicles from Ful Line Auto, every car is backed with a Warranty over and above state requirement, You will be greeted with a no-pressure, no-nonsense, straightforward answers to your used car buying questions because we want you to feel safe when buying a pre owned vehicle. Our mission is to make your car buying experience a positive one so you come back to Ful Line Auto for all your automotive needs. Used Automobile warranty laws (Secs. 42-220 thru 42-226, C.G.S) became effective in Connecticut in October 1987. Buy a used car from a dealer licensed in Connecticut. Pay at least $3,000 for the used vehicle. The vehicle is 6 years old or less. The vehicle is used for personal, family or household purposes. If you paid at least $3,000 but less than $5,000 for the used vehicle, the warranty is in effect for 30 days after the purchase date or 1500 miles (whichever occurs first). If you paid $5,000 or more for the used vehicle, the warranty is in effect for 60 days after the purchase date or 3,000 miles (whichever occurs first). The total purchase price includes all amounts charged for the vehicle, including the value of any trade-in vehicle, but excluding any finance charges, registration fees, or sales tax. The warranty as provided by Connecticut law requires that your car be mechanically operational and sound at the time of purchase and throughout the warranty period. If, during the warranty period, your vehicle is not mechanically operational and sound, your dealership is required by law to restore your vehicle to this condition. 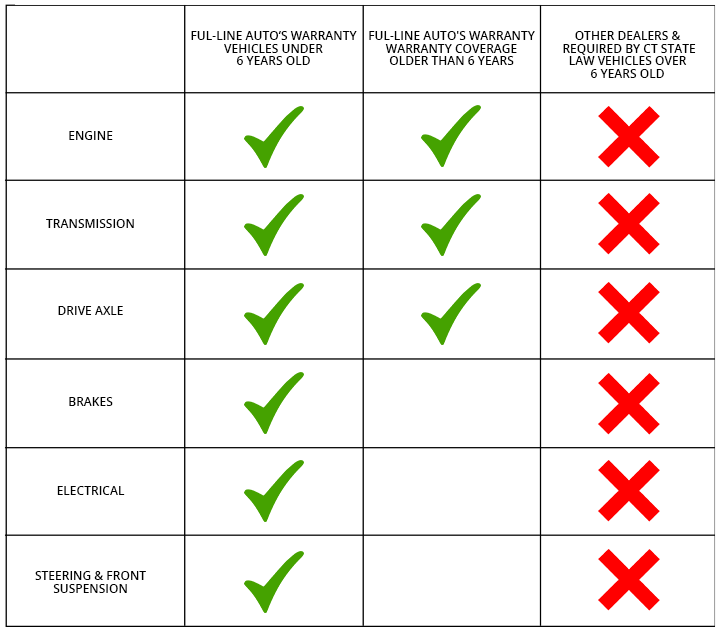 The warranty covers 100% of the parts and labor necessary to make your vehicle mechanically operational and sound. The law refers only to the mechanical operation of your vehicle. The law does not cover cosmetic features (e.g. paint job, upholstery) or convenience features (e.g. cigarette lighter, ash tray) of your vehicle. In general, the law does not apply to any feature of your vehicle which is directly related to the vehicle’s operation. This used car warranty law does not apply to any mechanical defects of your vehicle which the dealer can prove resulted from an automobile accident which occurred after you took possession of the vehicle or from your misuse of the vehicle. Your dealer must honor this warranty even if the warranty period has expired, provided you notified the dealer of a breach of the warranty within the warranty period as specified above. The dealer must give you a repair order to document that your complaint occurred during the warranty period. Furthermore, any period of time during which the used vehicle is in the possession of the dealership for the purpose of repairing the vehicle under the terms and obligations of this warranty extends the warranty-period for that amount of time. Repairs must be performed by the dealership who sol you the vehicle. The age of a used vehicle is computed as of January 1 of each new calendar year. Thus, at anytime during 2005 the law applies to model years 1999 and up. Nationwide up to 4 years coverage from date of purchase!